Wind has been a source of energy since the first sailing ships plied the seas. More recently, beginning in the middle ages, humans tapped wind energy to grind grain and pump bogs. 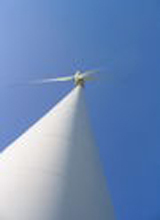 With the rise of the coal-petroleum industry, wind was subjected to a competitive disadvantage. But 100 years of disadvantage is now shifting as governments realize the wasted resource that is literally blowing past towns and farms across the world. Some fossil fuel entrepreneurs have realized the importance of the resource (T. Boone Pickens) and have been working to develop massive wind farms on an industrial scale. But even if these large farms succeed, we encourage farmers and rural property owners to investigate the advantages of wind.